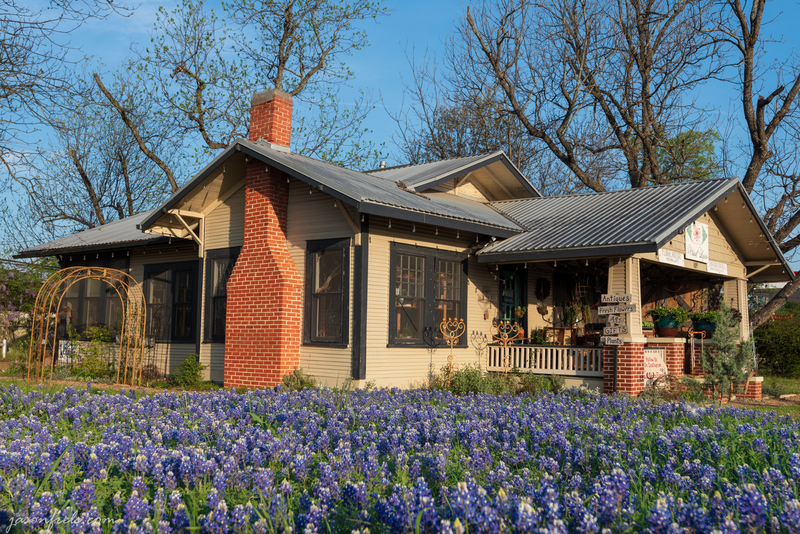 Early spring means bluebonnets everywhere in many parts of Texas. It does seem like I mostly see them on the borders of busy highways though, so it is not easy to find a good photograph. The other problem that I have had photographing all of the bluebonnets is subject isolation as it can be difficult for the eye to immediately see what is in focus with so many flowers everywhere. So, I set out to work on these problems this week as we had nice weather and lots of flowers. One of my main strategies is to actually have my camera with me. This sounds silly, but I often have found myself in a location with what looks like a promising composition and not had my camera bag. So, I have been bringing my camera bag to work in hopes of getting some photos. 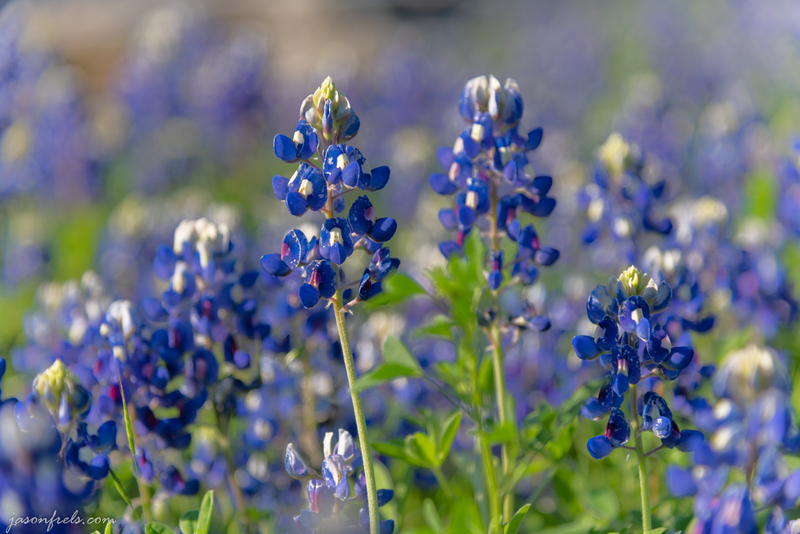 In the picture below, I have photographed some typical bluebonnets. The challenge with this photo is providing enough isolation of the subject that is in focus compared to all of the background bluebonnets. My main strategy here is to find some prominent flowers that are a bit separated from their neighbors, use a long focal length on wide aperture, and get as close to the flower as possible. For this photo I used a 24-120mm, f/4 zoom lens and extended it to 120mm and set the aperture to f/4 (the widest it will go). I found these tall bluebonnets sticking out from the rest and got down low and close to take this. The flowers in the background are recognizable, but they are blurred enough not to rob attention from the in-focus flowers. And I think that it makes a nice foreground. I also managed to find a lone flower for a solo shot and there was a shady wooded area behind it. I got down very low to isolate the flower from the grass and got the photo below. Lone Texas bluebonnet on a spring morning. The background turned out very dark due to the dynamic range of the scene, even though it was a sunny morning. I think that this photo works quite well. To get down low, I put the camera in live-view and tilted the screen up so I could see it. I used single-point, single-servo auto-focus to achieve focus lock on the flower and then composed the scene and shot the photo. Shot at 120mm, f/4, 1/800s, ISO100. Nearby, I found some Paintbrushes near some decorative rocks. I spent a bit of time trying to work out a background for these flowers as I was close to a parking lot and didn’t want that in the background. Below is the composition that I settled on. The main focus point is the center flower. I think that the red reads well against the gray background, but I do find the texture of the background to be a bit distracting. 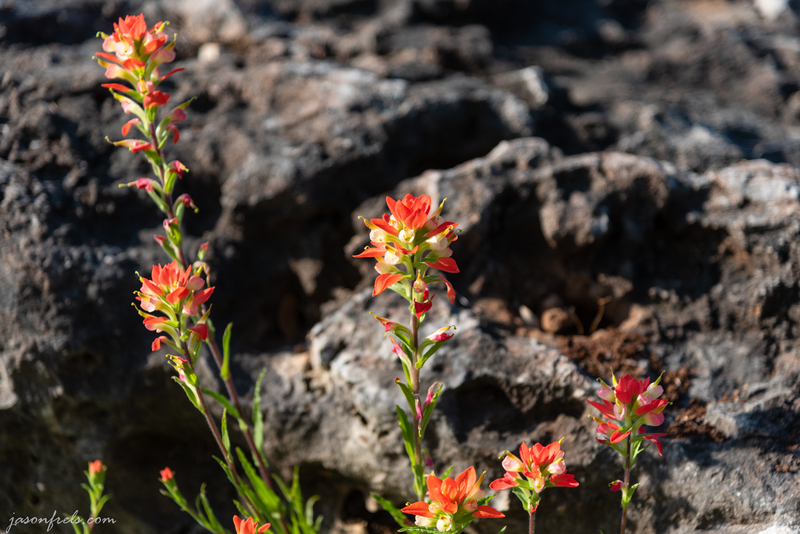 The flowers were too close to the background rock to use bokeh to soften the rock’s texture. The above photo was shot at 120mm and f/4. 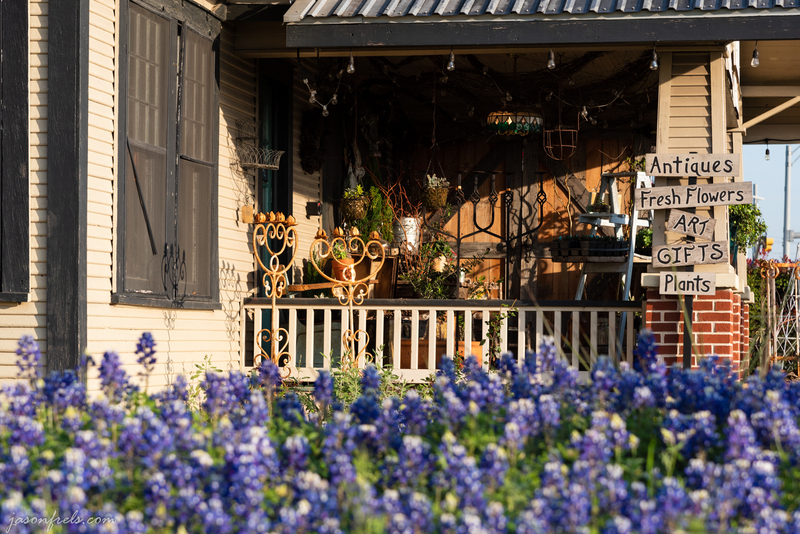 Near my home in Leander, there is an antique store with a large patch of bluebonnets in front of it. I drove by this one evening and thought that this would make an excellent composition. I saw that it would catch direct morning sunlight so I planned to stop here on my way to work during golden hour and take some photos. Below is a photo that I took on my first morning stop here. There was actually a lot of troubleshooting involved in getting a decent composition here. First, there is a busy highway at my back which limits where I can stand. Next, there is also a large utility pole in this yard casting an undesirable shadow across the yard. You will also find an Exxon convenience store right behind this building, which does not go with this composition at all, so I was shooting around that. So getting home and reviewing my first attempt I found several problems with my composition. I focused on the flowers instead of the antique store. There are so many flowers that you can’t tell what’s in focus. The signs on the antique store are out of focus and something that your eye would be drawn to. The signs on the antique store seemed to want to be the main subject, and in my attempt to hide the Exxon station, I had shot them from the side and put them off to the right of the photo. So, the next day I was blessed with nice morning sunlight again and I went back to retake the photos and solve my composition problems. 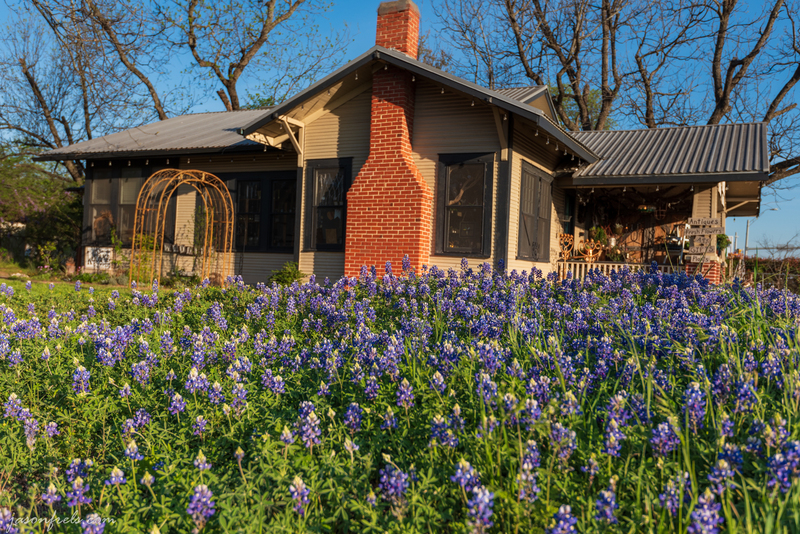 This time I wanted the building to be more of the main subject with the bluebonnets in for general color and beauty. The focus was set on the rustic signs in front of the store, which the viewer will naturally want to read. I changed by angle on the building to bring the front porch around towards the viewer and worked on blocking the gas station with the tree branches. I think that this composition works a lot better. The flowers are still there and obvious and it doesn’t matter to the viewer that they are not in perfect focus because there are so many of them that it is more of a pattern. This photo was shot at 35mm and f/8. Shooting from kind of low (in a ditch) and a little wide (35mm) it is difficult to decide which lines want to be vertical. If I straighten the chimney, the house looks like it is about to fall out of the picture. I did try to level on the porch rail. Another thing about this scene is that there is a lot of color from the flowers and from the warm golden hour sunlight. The above photo is not saturated. In fact, I played around a lot with reducing saturation in some of the images. See the photos below showing before and after with de-saturation. I didn’t like this edit as much and I think the rich natural colors work well enough in the original image. It is what the scene looked like. You may also see it differently depending on your monitor or device. I also tried a close-up for a detail shot that still has the bluebonnets. I am probably most happy with the shot showing the full house. Please, tell me what you think in the comments. 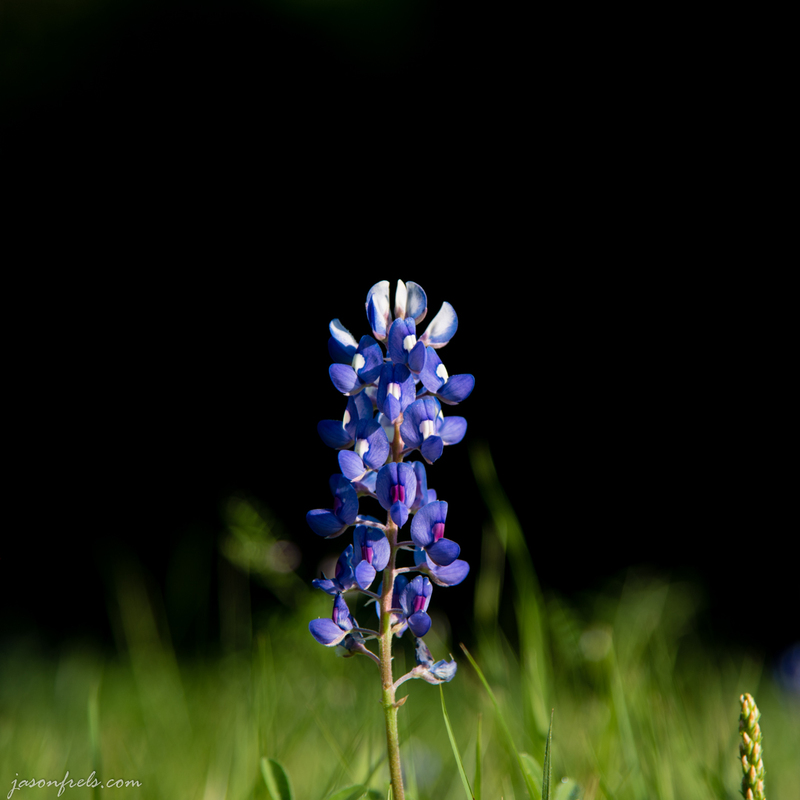 I had taken bluebonnet pictures in the past and thought about why I didn’t always like them. I found that when there are too many in the picture, I don’t know where to look. So, I tried to focus on isolating the flowers. So true! Love that! I do like the single ones the best, they are truly beautiful just with one in a single shot. Thanks. I like it as well.